Is it just me or are those parentheses in the wrong place? No matter, the punctuation is far from being the most irregular thing about this movie. This odd little pic has gone out on a number 4. Saturation is normally reserved for action, comedy or adaptations of best selling books so it is getting good circulation. It is possible that, as with Nicholas Winding Refn’s weird Drive follow up Only God Forgives, the cinemas and (audiences) did not quite know what they were getting. Still, they billed it and they came. Birdman is number seven in the current box office top ten two weeks after it opened. Featuring a handful of big name actors, the publicity made it look like a light comedy with elements of fantasy. There was Michael Keaton in the trailer, knowingly playing an ageing actor looking for creative redemption after making a series of superhero movies. We would see his artistic struggle and we would see him slowly cracking up as the two sides of his conflicted personality battle one another. It looked like Black Swan with chuckles. That isn’t really what it is though, at least that’s not all it is. Birdman as (it shall henceforth be called) is an interesting mix of creative decisions. The frame around which it is built is a fairly simple story of temperamental actors putting on a play. If you are familiar with Michael Frayn’s play Noises Off then that is the territory we are largely in. First off there are the soap opera relationship dramas; infidelities, pregnancies, failed parents, wayward children, alcoholism, fights and brandished firearms. Then we have the sitcom set pieces. At one point we even get a scene where someone gets their bathrobe stuck in a door and has to dash semi naked past crowds of people. There are twists on all of these tropes though that lift the film above the conventional. Layered over the basic premise is an element of caricature and with it some satire. The character Keaton plays clearly bears comparison to himself, at least in terms of his filmography. He is described as having been the original superhero, the man who started the gravy train that everyone else is now riding. Robert Downey Jr is specifically mentioned as a less talented actor who owes the man his current success. I can only imagine the part was written directly for Keaton and if they couldn’t get him they were going to ask Tobey Maquire. Superhero movies as a genre are mocked throughout despite several of the cast having them on their CVs. As well as Keaton with his two Batman movies and Norton with Hulk, we have Emma Stone fresh from exiting The Amazing Spider-Man series and Naomi Watts who appeared in Tank Girl. They aren’t biting the hand that feeds though as the lampooning is very gentle and the film’s main target seems to be Hollywood stars who chose to act on the stage. Mind (you, Emma Stone has done that too.) None of the satire is cruel. Birdman asks questions about things such as the value of bad plays over good action movies and the power of critics but then deliberately and deftly avoids answering them. The fantastical elements are simply going on in his head and that is all you need to know. His imaginings are not sufficient to transport him away from his real existence though. Picture if Dorothy had dreamt being surrounded by witches and munchkins but still stuck in a hurricane devastated Kansas, or if Alice was conversing with the Cheshire Cat on the banks of the Isis in Victorian Oxford. That is basically what has happened here. He hasn’t gone down the rabbit hole, he’s just got his foot stuck in it. 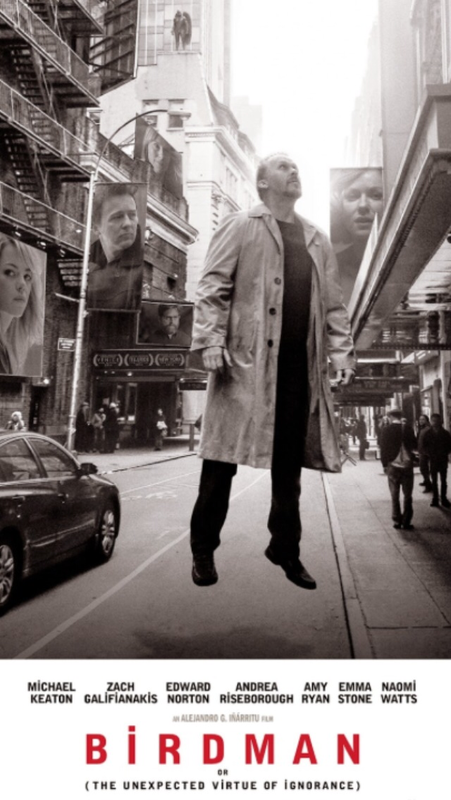 The final aspect of Birdman that sets it apart is the directorial style and technical approach. The whole film is edited together to look like a single continuous shot. Hitchcock famously did this in rope and Brian De Palma had a go with the first twenty minutes of Snake Eyes. It’s a neat trick and skillfully done by director Alejandro González Iñárritu and his cast. The action takes place over three days and some of the scene changes are really clever. There are moments when the camera moves up then down again which is an easy short cut but elsewhere time passing is more handled more subtly. Contrary to many of the reviews, I think Birdman is ultimately less than the sum of its parts. It is all very interesting and the performances are great but it is not something I intend to watch again. A masterpiece is something you can stare at for hours and return to again and again. This is more like an Escher painting; very skilfully constructed but once you’ve seen its surprises you want something a bit more vibrant. There are seven main cast members and four of them are women. They are flawed but much less so than the men and each seems real enough in this exaggerated context. No one is objectified but there is a moment when two of the women get a little intimate. It is not clear why and it is not something that is returned to in the plot which makes me wonder why it is there. Maybe it is a feminist statement, maybe it is just because some guys like seeing girls kiss. Birdman is a 15. There is quite a lot of swearing and innuendo and extended scenes of men in their tighty whities. I’m interested in seeing this, not only for the continuous camera shot, but the cast is strong and i like the idea that the actors all worked together, gathering that feel of a theatre rep production, making it raw? and an ironic use of certain actors in the roles. I do like the fact that mainstream Hollywood are behind this film which is essentially got the feel of a small indie/ Sundance-esque film, however in doing this it probably loses some of its appeal ( as I quite like the fact I feel like I’ve found a gem + not everyone has seen it!). Good to see the use of black and white, adding to that allen/indie feel. Hmm! I’m not sure it is going to quite be quite what you anticipate but it’s good that it defies expectation.